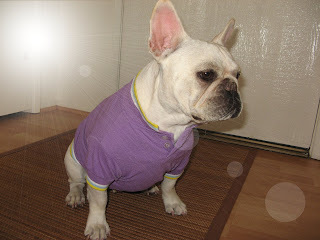 Benny shown in a sporty lavendar polo with white & yellow trim by Signature. 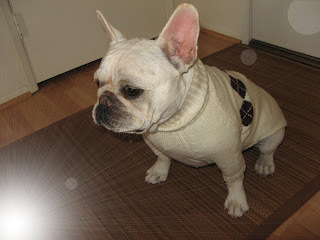 Benny in his favorite cream colored Charlie Brown sweater. 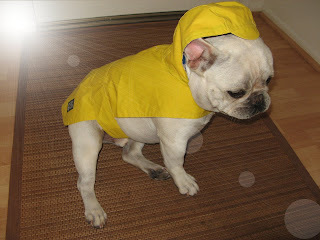 Benny shown in his yellow slicker. 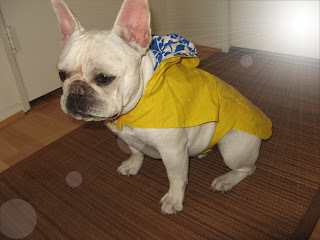 The raincoat may be worn with or without the hood. Great for the California rainy season. Imported from Old Navy Dog Supply Co. Thank you friends and fans. WOW you are a male fashionista (fashionisto?) for sure Benny! You can be a model for Ruff Lauren. We can't get over all the outfits you have; will Lily be strutting her stuff on the cat walk (dog walk)too? You look adorable, Calvert and I agree that the last photo of you is the bestest! You sure make a terrific model. I like the Charlie Brown sweater best, but could really use that rain coat today! OMG! The Charlie Brown sweater! That looks just like one of my momma's outfits. 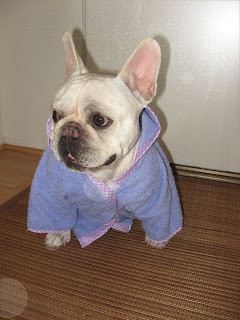 The last pikh...with the periwinkle robe is THE WINNER! and NOT just bekhause of the khlothes! Way to work it Benny!!! I love your Charlie Brown sweater too! We love all the outfits. Our favorite is the charlie brown sweater. Super cute. Oh My DOG! I LOVELOVELOVE the yellow on you Benny! It's fantastic! Wow, that was a great fashion show and thank you. The robe is my personal favorite. Mom likes the slicker. 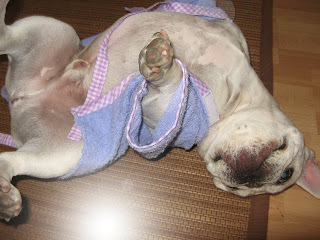 Benny, buddy.....yer the only guy I know who can pull off lavendar and periwinkle.